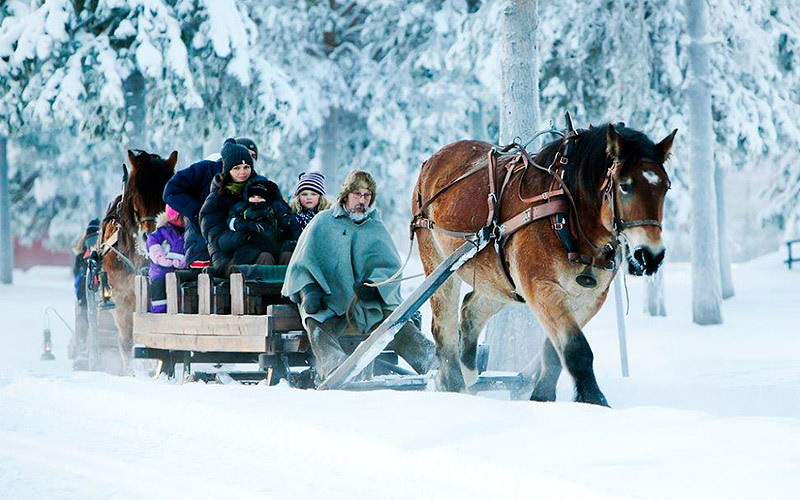 Join us on a wonderful, bracing sleigh ride to our log cabin in the woods. Luxuriate in the silence, nature, snow and winter darkness in all its splendour. It’s as if time has stood still. Following a sleigh ride snugly wrapped up in warm blankets through glittering trees with gleaming, untouched white snow swirling around the horse’s hooves, we head into the wilderness. On arrival at the cabin you’ll be greeted by a hot drink and regaled with tales from the past, as the log fire begins to blaze. Chances are you’ll catch a glimpse of the wonderful Northern Lights dancing across the sky, and if you’re really lucky you could even meet Santa himself around the fire. Our log cabin can accommodate groups of 5 to 36 people, and we serve hot food, beverages and other snacks. This secluded landscape is the perfect place to unwind and be at one with nature. The snow-covered trees all around, raging open fire and winter darkness combine to form a stunning scene. 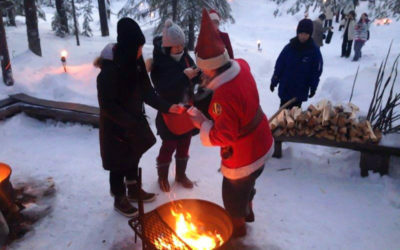 If necessary, we can also arrange warm clothes, refreshments and transfer to the sleigh ride departure point. Contact us to book or discuss ideas based on your individual needs. 2–4 people: SEK 1045 per pers. 5 people or more: SEK 790 per pers. Includes: Sausage barbecue, hot beverage and snack. Max 2 bookings per day. Warm clothes are available if necessary. Transfer from Gällivare to Nattavaaravägen can be arranged if necessary. Lunch and dinner can be arranged on request.